Two years ago, the Census Bureau announced the nation had reached a new demographic tipping point: The share of U.S. babies who were a racial or ethnic minority had edged past the 50% mark for the first time. The finding was widely covered as a dramatic illustration of the agency’s projections that the U.S. will become a majority-minority nation within three decades. But that tipping point may not have arrived yet, according to preliminary 2013 birth data released last week by the National Center for Health Statistics. The center’s numbers indicate that non-Hispanic white mothers still account for 54% of births—as they had in 2012 and 2011. The Census Bureau’s initial announcement was that members of minority groups—defined as anyone who is not non-Hispanic white—accounted for 50.4% of the U.S. population younger than age 1 on July 1, 2011. The bureau’s annual population estimates for July 1, 2012, placed the minority share at 50.1%. The agency’s annual population estimate for July 1, 2013, is to be released June 26. In recent decades, non-Hispanic whites have been a shrinking share of newborns in data produced by both agencies. To some extent, the data discrepancy between them reflects differences in what each agency measures: The Census Bureau classifies the children based on the race and Hispanic origin of both parents, while the National Center for Health Statistics reports only the mother’s race. The two agencies also use somewhat different methods to categorize race. But the bottom line is that people who want to know whether a new era in the nursery has arrived may be scratching their heads wondering which interpretation is correct. The trend toward a future nation in which non-Hispanic whites are no longer the majority is driven by the relatively faster growth of the nation’s racial and ethnic minority groups, especially Hispanics. Growing shares of U.S. births are to members of minority groups, who tend to be younger, and more likely to be of child-bearing age. In addition, Hispanic and black women (but not Asian-American women) on average have more children than white women. Immigration plays a role too, because most of the nation’s new immigrants are Hispanic or Asian American. Based on these factors, Census Bureau projections say that by 2043, the nation will have no racial majority group. Both the Census Bureau and National Center for Health Statistics numbers are based on information in birth certificates from the states and the District of Columbia. However, arriving at an accurate classification of children is a challenge because the certificates have limited information about the parents’ race or Hispanic origin. For one thing, some birth certificates include only information about the mother, not the father, especially for unmarried mothers. In addition, states do not all use the same racial and ethnic categories on their birth certificates. The biggest source of inconsistency is that six states do not allow parents to check more than one race box to describe themselves, even though this has been an option on census forms since 2000 and a federal policy since 1997. These states—Alabama, Arizona, Arkansas, Connecticut, New Jersey and West Virginia—accounted for about 9% of U.S. births in 2013, according to the center. The impact of mixed-race Americans on the overall population is relatively small: In the 2010 census, 9 million people out of 308.7 million checked multiple races. But it is a group that is disproportionately young and is growing faster than the nation overall. In order to have consistent data, the National Center for Health Statistics changes mixed-race parents into single-race parents in publishing its birth numbers. To do so, it uses a “race-bridging” protocol worked out with the Census Bureau, in which people who chose multiple races are assigned a single race using a probability-based model derived from research into which category they would have chosen if they were permitted to choose only one race. Among multiple-race Americans counted in the 2000 Census, 53% were changed to white, 24% to black, 15% to Asian or Pacific Islander and 9% to American Indian or Alaska Native. 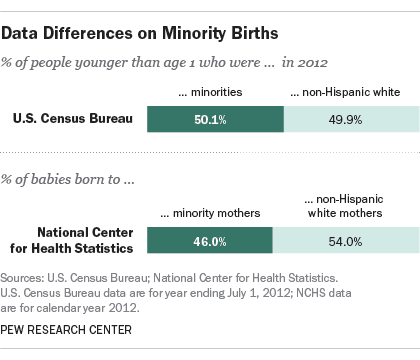 So no births are reported by the center to mixed-race mothers. However, when the Census Bureau receives birth-certificate data, it uses the same protocol in the other direction, and re-classifies some single-race people into mixed-race people if they live in states that do not allow multiple races to be recorded on birth certificates. Because this method would convert some non-Hispanic white people into people of mixed race, it would add to the count of minorities. The birth certificate data are a main ingredient the Census Bureau uses to produce the total number of the youngest Americans that are part of its annual population estimates by age, race and gender, published each June for the previous July 1. (It also uses information about deaths and immigration, which have a small impact on the estimates for very young children.). But because birth data lag the population estimates by more than a year, the bureau has to make adjustments, which is one reason why whether a tipping point has been reached is uncertain. For its July 2012 estimate, released in June 2013, the agency had birth data only through Jan. 1, 2011. So the bureau undertook a complex, multi-stage update process, factoring in population patterns and race boxes checked by families in the 2010 census. It then applies birth rates (as well as death and immigration rates) to produce more current totals.